CINEPLEXITYÂ® brings movie fans together for delightful movie madness! 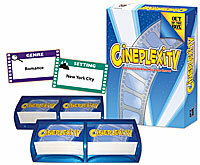 Each round, players race to name a movie that includes elements from two CINEPLEXITY Cards. Be the first to come up with a title and you win a point. With over 500 cards youâ€™ll have hundreds of hours of fresh movie fun! Can you name a film which is a Romance and is set in New York City? * If so, then CINEPLEXITY is the movie game for you! * Youâ€™ve Got Mail, Annie Hall, An Affair to Remember, and Two Weeks Notice, would all be great answers!